For everyone crazy about the outdoors, Bariloche is a wonderful place. We LOVED it. If you like hiking, biking and kayaking, prepare for long days! We started out with renting bikes and doing the Circuito Chico, a 30 km bike trail along the shores of the amazingly scenic lake Nahuel Huapi. This route took us to some stunningly scenic viewpoints and made us decide to extend our stay for a bit. Once along the route we traded in our bikes for kayaks and paddeled around for a while in the crystal clear but icy cold water. Back in the city, we then had to take the hardest decisions of the day: which should be the first chocolate and ice cream manufactory to pick and which flavors to taste? Sugar shock shaken but satisfied we then continued to explore the rest of Bariloche’s center and eventually some more chocolate stores. We topped off our first day here with watching the sun set over lake Nahuel Huapi and sharing, once again, a tasty Argentinian pizza. These normally come, like everything else, in huge serving sizes. That’s because people here love to share orders, no matter if it’s pizza, beer or anything else. The next couple of days we spent mostly hiking, enjoying marvelous views and of course, tasting some more artisanal chocolates and ice creams. We also discovered, that hitchhiking is a great way to get around, as sometimes the buses just won’t come or hardly serve specific areas. When we left Bariloche, we all agreed: We would be back here! For instance, skiing one of the volcanoes in winter would definitely be an amazing experience. Where to eat & drink: Rapanui – just one of the many chocolate stores in town where you can indulge in tasting delicacy chocolate as well as amazing ice cream. What to do: Circuito Chico – rent a bike to get the big picture perspective on the areas beauty. You can buy a combo package and rent a kayak along the way as well. And… don’t miss out on the amazing hiking which comes at any level you want. 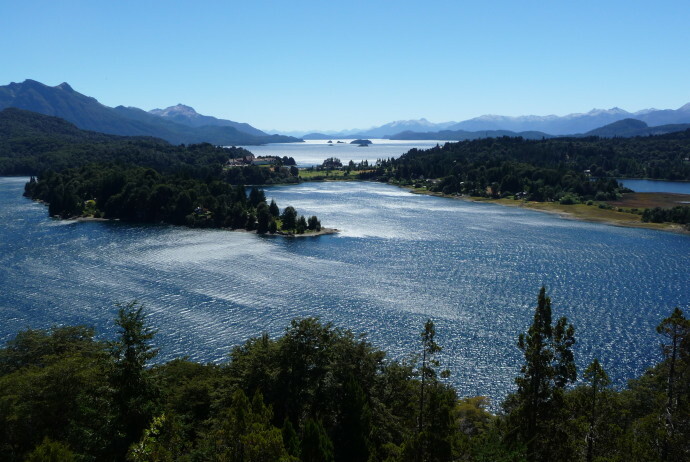 Our favorite one was Cerro Lopez – a steep hike which rewards with stunning views over lake Nahuel Huapi.